With the amount of Madrid activities available and only a short time in the city what do you choose to do? Madrid Guide Spain was constantly being asked to come up with list of "Must do´s" or "Recomendations" so in response to your feedback we have done so. ....but do not let that stop you recomending your own favourite Madrid activities! Madrid Guide Spain has taken some of your suggestions and added them to our own to come up with a series of "Top Ten´s" as well as "Must do´s" for 3, 5 & 7 day visits! The top ten Madrid activities for those who have a passion for the finer points in life. Madrids History, Art and Literature in one place so as to be sure not to miss a thing! Madrid from street level. Where to go and what to see whilst exploring the city on Foot! Okay, we will admit that you will probably have to take the Metro or Bus between one or two of the places... but remember you do not have to see all these places in one day! Those things that are quintasentially Madrid. Push the boat out and do something different. 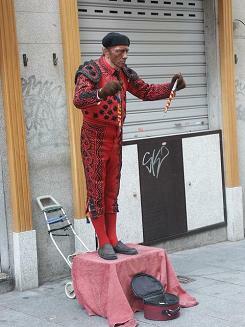 Experience that which only happens in Madrid! Experience the city from the seat of a classic retro icon - The Vespa motorcycle. Perhaps one that you will not be taking the kids along on! Let tounge drool and mouth water as you look over our Top Ten suggestions for Spanish food that has to be tried. Includes a brief description of how each dish is prepared... so check this out in case there is something you prefer to avoid the pigs ears! Be part of the tourist crowd and do or see those things that every guide book recommends with our FREE Madrid walking tour! Includes all the famous and popular Madrid activities. Appropriate for all ages as well as the elderly & disabled. Off the beaten track a hotch potch collection of those things city residents do to keep themselves entertained. Only here for the weekend? Not sure what to do and what not to? How do you choose? Try our recomendations for inclusion in any three day visit to Madrid. Here in Madrid for a few days before heading on to somewhere else in Spain as part of a larger trip or tour? Select from our list for a paced discovery of Madrid that will make sure you get the full experience without feeling exhausted after having run around at 100mph! Enough time to go a little further afield and discover both Madrid and its envions. Full day and half day activities that show a little more of rural as well as city life! Found a new activity? Let us know!